If you are a window cleaner used to using a squeegee and applicator, think about it like this. On a water-fed pole the brush is doing the job of an applicator and the water jets are doing the job of a squeegee. And here in lies the basic technique. Brush the window down as you would with an applicator and then rinse it off in an ‘S’ line pattern as you would a squeegee. With a squeegee you slowly cut in at the top, then you quickly squeegee off the rest. With a water-fed pole you similarly spend more time rinsing off the top making sure the water rinses into the rubber seals, then you can ‘S’ rinse your way down the window. Water-fed Window Cleaning - How it works. Update: Original pencil jets in the middle of the brush required lifting the brush off the glass to rinse. With a spray bar/rinse bar fitting or similar adaptation that sprays above the brush, it is now possible to rinse while scrubbing without needing to pull the brush off the glass. This reduces both strain and time. Pure water of a TDS (total dissolved solids) reading of 0-10 (preferably zero) will give a window cleaner a spot-free window because chemicals such as fluoride, chlorine, and calcium etc have been removed. That is of course if the correct technique is used. There is a lot of misinformation online regarding pure water window cleaning. To clarify, pure water is not anymore effective as a cleaning agent than tap water is. The only difference is, tap water will spot, pure water will not. Firstly, the brush must meet the window head on. The brush needs to be square on the window with a nylon brush – There’s no agitation on the side of nylon bristles, only at the tips. Single trim brushes have bristles that are one length only. Dual trim have both longer and shorter bristles. All other things considered equal the more bristles there are, the more scrubbing power you have. Hogs hair/Boar hair bristles have much more scrubbing power than nylon (the entire fibre is an effective edge unlike nylon) but can also weigh more and create drag on the glass – a hybrid aims to merge the best of both worlds. The other thing to consider for very high polling is that hogs hair will have much more dirt trapped along the bristles than with nylon, so a hogs hair brush needs to be pulled off the glass to rinse which may be difficult if not nearly impossible as some heights. The rinsing off method depends on the type of glass. Is it hydro-phobic or hydro-philic? Hydro-phobic glass will repel the water. This is seen when the water is flowing down the window in rivers. In other words, there isn’t good coverage of the water on the window. In such a case a window cleaner needs to rinse more thoroughly to be sure the whole window has been covered. Hydro-philic glass on the other hand has good coverage and the water will film over the glass. Hydro-phobic glass will require a more thorough methodical approach with pencil jets but is still fairly easy to handle with a rinse bar as it rinses in sheets. Runs from the top – Dirty water can either be running from the frame or the rubber seal. To avoid this, the frame needs to be brushed and washed down. Otherwise the frame will drip dirty water onto the glass. Another technique is to wash the frames down first and then come back and clean the windows when the frames have stopped dripping. Dirty water could also be bleeding from the top rubber seal. To avoid this, the top must be slowly rinsed to ensure the dirt from the seal has been completely washed out. Spots all over the first window – This could be because the initial surge of water through the resin will have a higher than normal TDS reading. To avoid this problem don’t spray the first surge of water on the window or start by spending some time brushing down frames etc first. Spots down the sides – This could be due to the window cleaner not spraying into the edges when rinsing. The back of the brush can obstruct view of the water spraying out of the jets. The pencil jets are more toward the middle of the brush so to effectively rinse you will need to ensure that you point the jets at the edge and ensure the water is sprayed into the seals. Runs down the sides – The rubber seals as well as frames are full of dirt. These need to be both brushed and rinsed down thoroughly enough. Otherwise dirty water will bleed from the seals instead of pure water. Spots toward the bottom of the glass – If the window cleaner only rinses the top of the window and doesn’t follow through by rinsing all the way to the top, it will leave water marks toward the bottom of the glass where complete glass coverage was not achieved with the rinse. Spots all over – This could be caused by too much flow pressure. Its window cleaning, not high pressure spraying! If the flow rate is too fast, when you rinse off you’ll be pushing the dirt up the glass, not just down it. Dirt on the window – It was not brushed down sufficiently and this could be because of the brush angle on the window. If the brush is not square on the window and the bristles are not splaying, proper coverage will not be achieved. Spots in the corners – This could be due to not thoroughly rinsing into the corners. A lax ‘S’ stroke method could mean that the corners are being missed. To avoid any spots the entire window needs to be covered in the rinsing process. The simplest form of water filtration or water treatment system is a de-ionization tank. This consists of DI resin in a DI container with an inlet and outlet. In hard water areas like Perth Australia a carbon pre-filter is a must. The water needs to run through the carbon filter first before entering your DI tank. The carbon filter helps in removing chemicals such as chlorine and fluoride that will destroy your DI resin. So, be sure the water is running through the carbon filter first and not the other way around. A sediment filter is also recommended. How long the resin lasts varies depending on the size of the tank and whether you’re running dual tanks or single tanks as well as what type of resin you use. In hard-water areas a specialized hard-water resin will last longer. While using two tanks is certainly not necessary with the advent of mixed-bed resin, some window cleaners still choose to do so as they want the resin to last longer than one tank will permit (when dealing with jobs that take days, not just hours). Why? The saturation point of resin can be calculated but without constant variables this is nothing more than a rough estimation and constant testing of resin is recommended as the resin comes closer to it’s end. Another reason could be just to avoid having to change the resin as frequently regardless of job size – this choice is more popular in a van type set-up as it can be counter-productive with a trolley type set-up. Of course, just using a bigger tank will also solve the above issues but this may not be possible with some vehicles and bigger tanks are heavier and harder to change-out. DI resin is depleted when it comes into contact with carbon dioxide so it needs to be stored properly. Another type of water filtration for window cleaning is a combination RO/DI (Reverse osmosis/De-ionization) unit. This is more expensive to buy than a DI only unit but it’s cheaper to run if you’re a window cleaner in Perth that uses water poles regularly, not just a few hours a week. Each RO/DI system varies in output so it’s important to do your research. It’s important to note that output falls with back pressure for these types of units and the higher you work the more back pressure is created. Also, there will be water wastage unlike with DI only canisters. With a RO/DI system it’s still preferable to have a Carbon pre-filter for window cleaners in Perth. If the RO membrane is taken care of by flushing it out after each use it will possibly last three years or more depending on usage. If you’re running multiple poles or you’re cleaning high windows and need more pressure it’s helpful to have a RO diversion switch so you can run your pole straight from the DI tank. A pump is another option – you can also filter the water at home with a reverse osmosis only system and then bring a tank of purified water to the site pumping the water from your tank up the pole. Different areas in Perth can have different water qualities and resin loses its filtration qualities over time so testing the water first is helpful. A TDS (total dissolved solids) reading of 0-10 (or possibly higher) should leave your windows spot free as a general rule assuming the correct technique is adhered to. 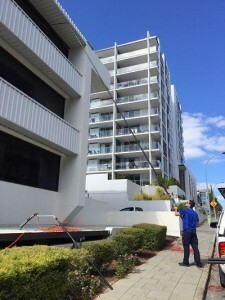 It is recommended that window cleaners in Perth use high quality resin manufactured specifically for hard water areas. Simply put, there are three types of poles; Modular, Telescopic, and Modular-scopic (Telescopic that has additional modular sections). A modular pole style is a pole that has many separate sections that fit into each other. The hose wraps around the outside of the pole and is attached with Velcro strips. Usually in 6 to 12 sections depending on length. Normally, each section pushes into the section above it by way of a taper joint. The sections can be quickly and easily removed as the window cleaner cleans his way down each section of glass. Modular light poles are well suited to repetitive work and high level glass where weight can be a problem. However, despite the advantages this pole style seems to have become almost extinct to make way for more all-in-one styles. A telescopic pole is one unit that has positive stops or clamps on each section that allows the window cleaner to lock the sections in at any height meaning exact placement on the window. It has a hose that runs up through the middle of the pole which keeps it out of the way and allows for quicker set up. Advanced new generation telescopic poles are made of various materials such as fibre glass, carbon fibre/fibre glass composite materials, and various types of carbon fibre designs such as unidirectional carbon fibre, high modulus carbon fibre, high modulus and Kevlar, just to name a few. The latter being the stiffest. High quality insulated handles provide the rigidity of carbon-fibre while keeping you safe from shocks. Various goose neck size extensions provide extra reach. A modular-scopic is a telescopic pole that has modular sections that can be added for additional height. Whether these sections are added to the bottom or middle, when fully extended or before extension, is design dependent but most are added to the base. Water pole manufacturing methods are developing fast especially in the field of carbon fibre composite materials and most poles are manufactured slightly differently offering various benefits. So do your research! The new generations of poles are both light weight and rigid allowing technicians to take window cleaning to all new levels. Pivoting tools for window cleaning include squeegees, applicators, squeegee/applicator combos, brushes, and scrubbing bar/water jet spray combos. With pivoting tools the ‘S’ stroke is created by a natural rotation of the forearm without undue deviation of the wrist from its neutral position. Pivoting tools can also prevent injuries and alleviate existing pain associated with repetitive window cleaning and awkward movements. With long pole window cleaning pivoting squeegees and two-in-one pivoting applicator/squeegee combinations can significantly reduce strain and can clean more effectively because the pivoting or orbiting motion means that the window cleaner can imitate the same ‘S’ stroke action that one would use at a ground level window. When it comes to pure water window cleaning there are also two-in-one scrubbing bar/pencil jet combos available as well as pivoting brushes with rinsing jets that sit above the scrubber. This means that the glass is being scrubbed and rinsed at the same time which reduces the strain of pulling the brush off the glass for the final rinse as with traditional brushes. As with pivoting squeegees the window cleaner can still create an ‘S’ stroke with a pivoting water-fed brush or bar with a natural rotation of the forearms, scrubbing and rinsing the glass simultaneously. That being said when cleaning extremely high glass a pivoting action becomes near impossible. Therefore, when using a straight up and down method a rocking style of poling will get you better coverage of the window while reducing strain. A rocking style uses the whole body as opposed to just your arms and shoulders. Also, the more horizontal the pole is the more brush pressure on the glass there is. But it will be difficult raise the pole to rinse if you’re standing too far back. Either aim for somewhere in the middle or brush the window while you’re standing back from the glass, then to rinse off shorten the pole so that the pole is more vertical. This will reduce strain on the body and you’ll be able to work for longer. If you’re a window cleaner used to using a squeegee and applicator, think about it like this. On a water-fed pole the brush is doing the job of an applicator and the water jets are doing the job of a squeegee. And here in lies the basic technique. Brush the window down as you would with an applicator and then rinse it off in an ‘S’ line pattern as you would a squeegee. With a squeegee you slowly cut in at the top, then you quickly squeegee off the rest. With a water-fed pole you similarly spend more time rinsing off the top making sure the water rinses into the rubber seals, then you can ‘S’ rinse your way down the window. Simply put, there are three types of poles; Modular, Telescopic, and Modularscopic. A modularscopic is a telescopic pole that has modular sections that can be added for additional height. Whether these sections are added to the bottom or middle, when fully extended or before extension, is design dependent.